The Lilac Headdress is made out of Toho transparent lilac. Swarovski Crystals hang at the edge of each fringe. Beaded stars are sewed on the headband. A Native Indian motif was weaved into the peyote stitcked headband. I can make this goddess headdress in any color of your choice. It can be costumed fitted, to guarantee satisfaction. To measure for a proper fit, use a dressmakers tape measure, measure your head right above your ears. After you have that measurement, measure from the center of your head down to right above your head. If you have any questions, or feedback, leave a comment below. 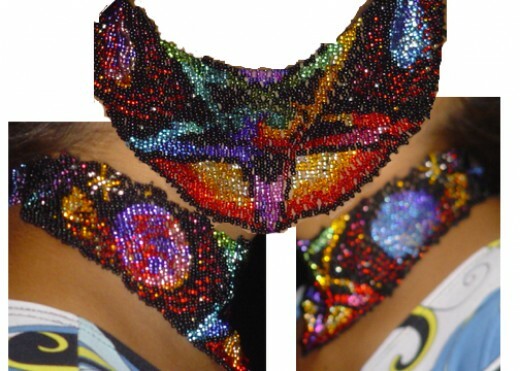 This head dress was crated with Black Jablonex glass seed beads. Black Obsidian, chips were used in the accent of the cap. The head band uses a netting stitch. I buy all my natural crystal chips from firemountain beads, therefore they are guaranteed to be real, and not just colored glass. Lost Memories of my childhood I did not think i was going to go back there, but here i am. SSN, Checking Account Info, Driver’s License or ID, and Employment Information may be required for any of these offers. Anything that you have to pay for, for a trial period must be cancelled in that offers trial period, to avoid additional charges. If you like the service you have tried, by all means continue it. Identity theft is a huge problem in the U.S. right now. People are looking for more effective ways to ensure the privacy and security of their information. This simple 2 page credit card submission purchase is a great solution for everyone. The Intelliprotect Identity Theft Protection software is cost effective and easy to promote to the security-hungry US population. User must fill out 2 page submission form and enter credit card information. This necklace is worked in the square stitch. It is 12 inches and clasps with a snap. 32 different colors used in this necklace. I purchased this as a kit from a designer named Dragon. It was the first beaded project I had taken on in 30 years. Completing these offers will net you in $75.00 in credit. Remember you have to follow the link from this blog. It will not convert if you book mark the link and go back to it later. You need to email me with the list of offers you have filled out. You need to respond to any email or phone calls, or they will not pay out. If you have any questions leave a comment below. Free, No-obligation, first-page submit, with no credit card info required. Need we say any more? Give your traffic a professional house siding quote from THREE recognizable brand-names. The offer is localized, well designed, and provides the user with INSTANT gratification via a phone call that comes from the advertiser itself to set up an appointment.